Having a lovely day today. Had a friend over this morning to check out bento supplies, which got me back into a more creative mood, so I'm thinking F&B and I need to make some goodies later on. Then last night, the kids and I ran into the Dollar Tree and found the Halloween print cupcake wrappers & picks that MuffinTinMom tweeted about the other day, so I'm in a very happy place with some new supplies! 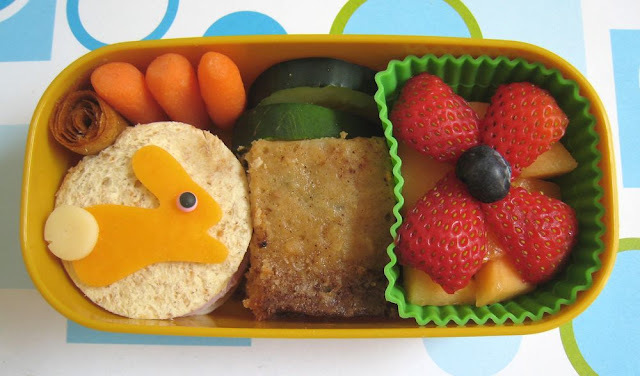 Today's a cute little bento for Faith, she helped pick what she wanted. She has a triple decker sandwich--ham, turkey, cheese, and the carrot-ginger spread, on Nature's Own Honey Wheat. I cut three circles from the bread to make a thicker layered sandwich and topped it with a cheddar bunny with a white cheddar cotton tail. ;o) She also has some carrot sticks and cucumber, a homemade peach-apple fruit roll up, the last garden zucchini bar, cantaloupe, topped with a sort-of flower made from strawberry slices with a blueberry center. Aww the little bunny is so cute! The candy eyes are perfect for the little cute bunny and you don't forget to put a 'fluffy' tail, score!